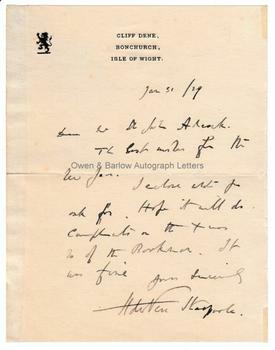 H DE VERE STACPOOL Autograph Letter Signed. Henry de Vere Stacpool. Irish popular novelist. Author of 'The Blue Lagoon'. ALS. 1p. Cliff Dene, Bonchurch, Isle of Wight. January 31st 1929. To [Arthur] St John Adcock. "The best wishes for the New Year. I enclose what you ask for. Hope it will do. Compliments on the Xmas no. of the Bookman. It was fine. Yours sincerely, H de Vere Stacpool." 8vo. 15 x 11.5 cms (5.75 x 4.5 inches). Mounting traces to left edge, else fine. Arthur St John Adcock was a novelist, poet and editor of the literary periodical 'The Bookman'. H de Vere Stacpool appears to be here contributing copy for an article in that periodical. Stacpool was one of the highest selling novelists of his generation. He was very prolific but he is probably remembered today only for one - the best selling 'The Blue Lagoon' which was filmed several times and which made him a rich man.